1) the encounter (and the encounter's result) will be for the moving character, whereas the other character will be completely immune. 2) if the moving character has Abilities or Advantages that he/she can use, the character will choose whether to use them before or after the encounter. Example. Fulmergh, the caretaker elf, has the Ability of Cleptomania, which allows him, at the end of the movement, to grab one of the Artefacts of the character who occupies his own square and place it amongst his active Artefacts. During movement, Fulmergh ends up in a square that is already occupied and has to have an encounter. But before he does, he can decide to use his Ability on that character. If he decides not to use it, he proceeds with the encounter. After the encounter, if the character remains in the same square, he can still use his Ability on his companion in that square. To determine the type of encounter, the player draws a card from the pile. If the player draws a Creature, he/she will face a Challenge. If it is an Artefact, the player adds it to the player’s active Artefacts. If it is an Event, it is considered an event that is played "against" that player, and the player will face the consequences, both negative and positive. Challenge. When a Creature card is drawn, the player must challenge it by beating it in the Characteristic that is featured on the card. 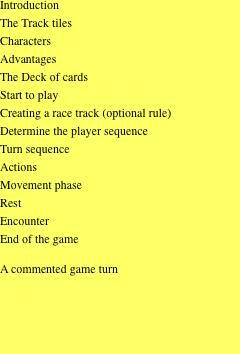 To solve the Challenge, the player plays a card and adds its numeric value to the value of the Characteristic of the Challenge. If the player has cards, he/she cannot voluntarily refuse to play a card. If the sum of the characteristic plus the value of the card is higher than that of the Creature, the character wins the Challenge and advances a square (if it is able to host the character. Otherwise the character remains stationary). If the player loses, he/she will need to backtrack to the first available square. Example. Player draws the Salamander of Mount Ohrk, a Creature with a Strength of 9. The character's Strength is 5. If the player wants to win the Challenge he/she must play a card with a number of 5 or higher (5 + 5 = 10). If that happens, the character moves up one square. If the player plays a card with a lower number, the character loses and has to backtrack one square. The Challenge is lost even if the player does not have a card to play, regardless of the Characteristic’s number value. Example. A player draws the Horrgrop the Evil, a Creature with a Strength of 7. The character's Strength is 5 and has Heroism, an Advantage that provides a +4 bonus to all the Characteristics in the Challenges. The player decides to use it, and now the character has a Strength of 9. However, because of what has happened during the player's turn, he/she has no more cards to play. Despite the use of the Advantage, not being able to play any cards, the player automatically loses the Challenge. Artefact. When an Artefact card is drawn, the player picks it up and places it amongst his/her active Artefacts. If the player wants, and the conditions allow for it to happen, it can be used immediately. Event. When an Event card is drawn, that card is considered to be played against the character who has the encounter and he/she will be subjected - if possible – to the effects (both negative and positive). In many cases, the Event may have no effect (for example, there may be a movement penalty, but since the character has already moved, the card has no consequences). For simplicity's sake, the Event cards that can have effects on the player who draws them as an encounter, there is an arrow symbol ( ) preceding the text. Example. The player draws Hills Guide, an Event that gives a bonus when moving amongst the hills. Since the character has already moved, the Event has no effect and nothing happens. Example. The player draws Wind, an Event that pushes back a character who is located in the plains. Since it is to be considered a card played against that character (there is an arrow icon on the card to remind players), the player should check his/her position. It the character is in a Plain square, he/she must backtrack. Otherwise it will have no effect (remember it that the card has been played against the character, so the other characters, even those who find themselves in the same square, are immune).